OK, well, getting the hang of it now. 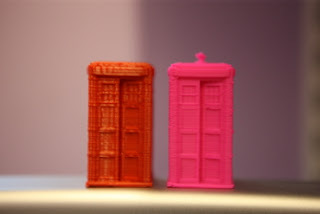 ABS and PLA are different types of plastic, so different characteristics and in particular temperatures. PLA works on lower temps than ABS. It expands (and hence contracts) less. PLA is, IMHO easier. The ABS needs a hot bed at least 100C and maybe more. PLA will stick to 60C hot bed. What surprised me is that different colour ABS is very different. The pink ABS (yes, the web site said magenta and no, it is clearly pink isn't it) seems more than happy at 245C or even 250C. It actually turns purple when hot, which is (a) pretty, and (b) useful to see WTF is going on when printing. Returns to pink as it cools. However, to my surprise, the red ABS is not happy at 245C. It is almost liquid at that temp, and before you know it you have a hot end full of boiled plastic and bubbles. It is happy at 220C. It is also shiny. The pink ABS is matt. I had no idea different colours behaved so differently! P.S. The red one is a salt pot, and works! How BT should do it?